I loved this book so much that I finished it in two days. A dystopian novel that touches on the time before and after a pandemic that wipes out most of the population. This book was a masterpiece. Written by a young Canadian, it has an amazing web of characters and touches on the human condition, friendship, hope, survival, heroism, and it evens comes with a touch of Shakespeare. A must-read for all! Place a hold on the library's copy today. This book caused a splash when Barack Obama claimed it was his favourite book of 2015. And I agree, it was my favourite as well. 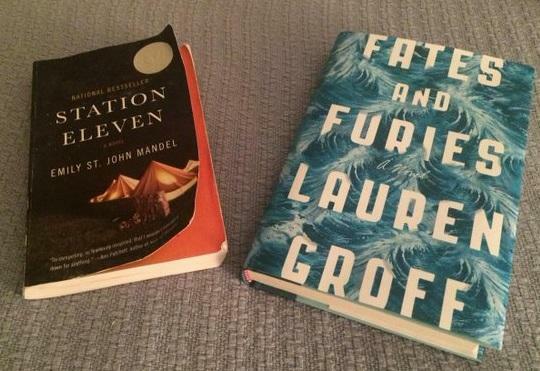 Lauren Groff writes quirky, interesting characters like no other. I enjoyed her novel, Monsters of Templeton, but Fates and Furies was a work of genius. Quite simply this book is about marriage and secrets. It's also about love, family, art, and magic. The prose was brilliant and there were just so many layers, almost to the point that I am sure most of it was going over my head (which made me appreciate her writing even more.) I cannot wait to reread this novel. Place your hold on the library's copy.